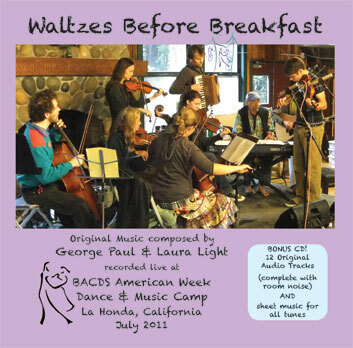 On the last two mornings of camp in July 2011, Marty Brenneis recorded the early morning waltz music. No special setup, no studio silence, no meticulous rehearsals, no retakes. This recording captures the magic of the moment, complete with the sounds and ambience of the camp dining hall before and during breakfast. Join us as we float spell-bound, enraptured by the beautiful waltz tunes composed by George and Laura, and played with haunting beauty by musicians who dance with their fingers as well as their feet. BONUS! the sheet music score for all tunes is included on the CD as PDF files. Pop the CD into your computer, and print the PDF files to have sheet music for all these beautiful waltzes. This CD has three purposes: to capture and disseminate several new waltz tunes never recorded before; to provide AmWeek campers with a memory they can share with family and friends; and to help raise money for the camper scholarship fund. Thank you for purchasing this CD!